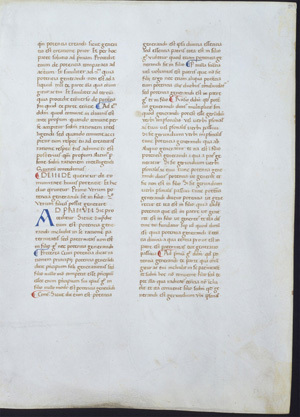 This leaf is from a manuscript copy of Thomas Aquinas's Commentary on the Sentences of Peter Lombard made in Italy in the late fifteenth century. It measures 28.5 x 21.5 cm, and is written in an attractive and clear Humanist book hand. The text is unadorned except for red and blue paraph markers and three-line initials, the latter accompanied by majuscule letters. There is pencil foliation in the upper right corner of the recto. See Denison University Leaf 40 for more information about this manuscript.